Getting married can be kind of like going on a road trip. You are trying to get from here to there in the most efficient and cost-effective way while maximizing your fun-having, still seeing all the sights you want and not killing each other before you get to your final destination. You don’t need to hire a navigator to go on a road trip, but it never hurts to have a map. So now that you’re engaged, you could go out and buy some of the 7.5 million bridal magazines that are sold annually and hope to find the information you need. You could spend an average 40 hours a week searching Pinterest and the rest of the interwebs for idea boards, check lists and how-to-tips to help you plan your wedding. Or you could ask a real live person the specific questions you have and get the answers you are looking for. This is where I come in. I have a long list of lessons learned from years of wedding planning experience and I am happy to share them with you! 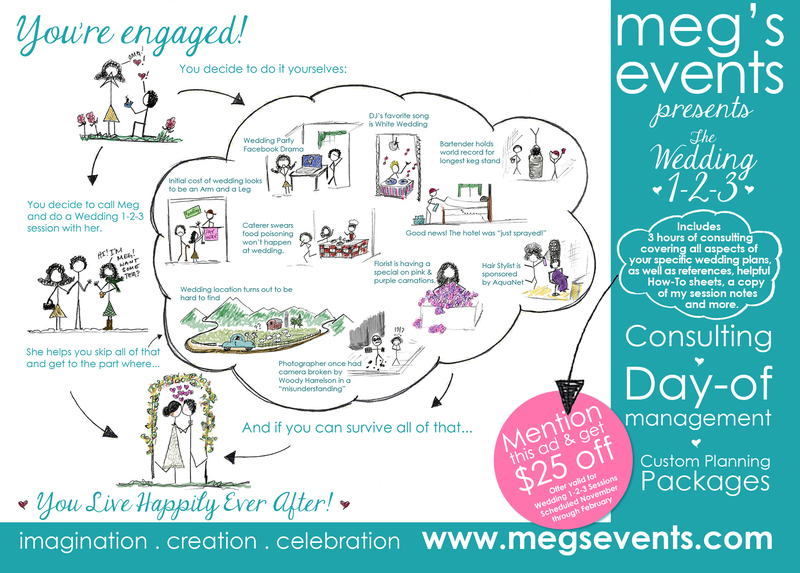 Spend a couple hours with me talking about your wedding plans and you won’t have to learn anything the hard way. I’ll give you an insider’s look at all the details – subtle and substantive – that will help make your wedding day perfect. We can map out everything from how to add personal, creative touches and do DIY the right way, to ways to stay within your budget and do seating charts. I’ll help you avoid the common pit-falls couples get stuck in and give you pointers on how to manage your time so your wedding planning doesn’t ruin your wedding! You’ll leave feeling much clearer about the path before you and have a much better handle on your gameplan. You’ll also walk away with a copy of my notes and a customized timeline to help you stay on point. If you decide you need more help from me down the road, you can apply the cost of your Wedding 1-2-3 to any custom package, so you won’t feel like you left your wallet in El Segundo. Contact me today and let’s talk about your wedding plans and how I can help. I’ll get you directions to Happily Ever After Avenue in no time!